WordPress. You need it. Trust me. 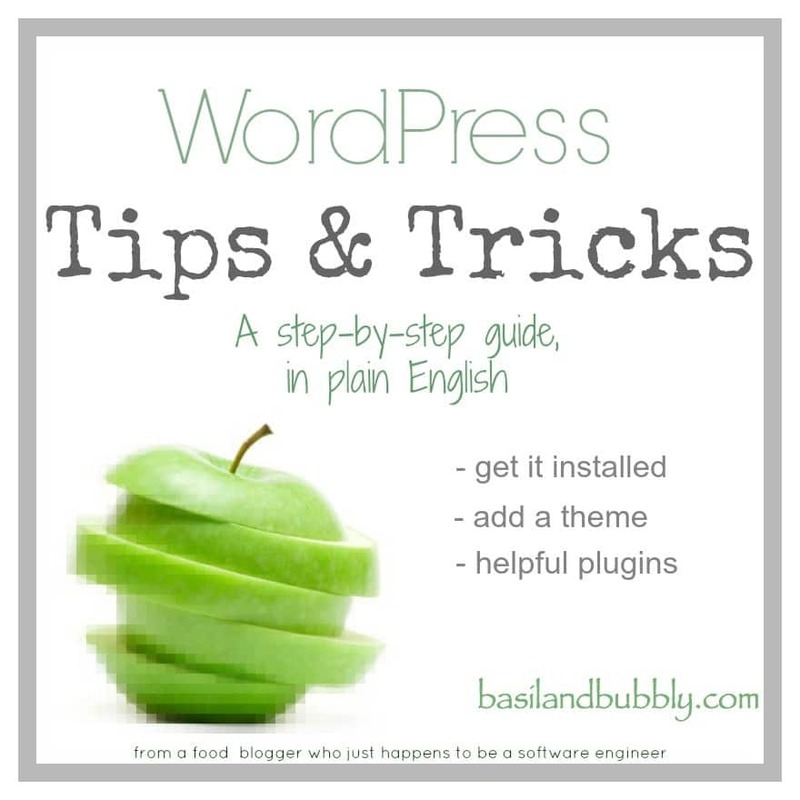 This page will detail how to get WordPress installed, set up, and beautiful! 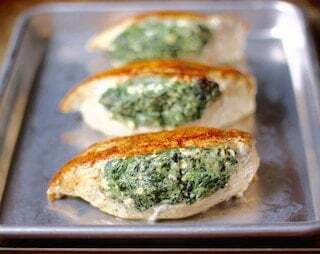 If you have not set up a website on which to install WordPress, please check out how to do that here: Starting a Food Blog! Now that you have WordPress installed, you have the basic tools you need to start blogging! You’ve probably noticed, though, that plain ol’ WordPress is …. ugly. Don’t worry! There’s hope! Alright! We’ve got the basics completed, woot woot! Now for the fun stuff: make it gorgeous. 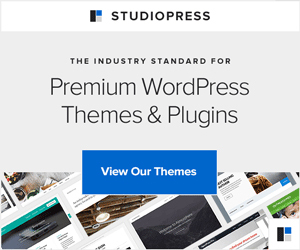 Themes are how you do that in WordPress. Themes can also offer you more ways of storing and keeping track of all the content in your blog, including sending out newsletters and changing styles, so picking one that fully serves your needs can truly make a difference. 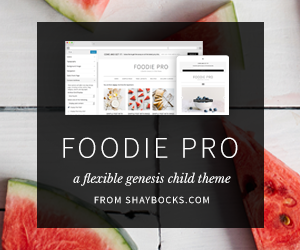 You can get any number of free themes out there ( I really loved Green Apples for a while ), but if you want to make life easiest and have the most freedom in designing your blog, go with the Foodie Pro Theme by Shay Bocks. That’s what I use now, and I could kick myself for not making the switch a year ago. The style is crisp and clean, and it looks beautiful on mobile screens with absolutely zero effort on the blogger’s part. The mobile part is important, because Google now uses your site’s “mobile friendliness” as a factor in ranking websites. That means that a mobile friendly site will show up higher in a Google search than one that is not mobile friendly, so it really can hurt you by ignoring the mobile crowd. 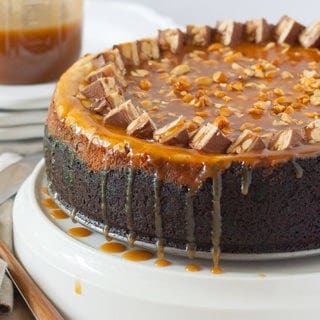 If you wish, you may customize it yourself, and I just so happen to have a guide for doing that: Foodie Customization Guide. All of their themes are built on The Genesis Framework. What does that really mean? The framework is another layer that sits on top of WordPress, giving your site even more options and functionality, and these themes are really built on top of that framework AND WordPress, meaning you need both to make them work. It’s worth it though — the framework gives an even better foundation for your site. At this point, WordPress is installed and you’ve decided on and installed a theme. Even if it isn’t The Foodie Pro Theme recommended above, all of these plugins will still work for you! Plugins work with WordPress to allow you to customize how WordPress should work for you. To add a new plugin, go to the left toolbar on WordPress. Highlight “Plugins”, then click “Add New”. On the right side of the page, there is an input box for searching plugins. You can search for anything you’d like, but these are the ones I use and recommend. If you are using The Foodie Pro Theme, some of these may already have been installed for you. That’s it! You’re ready to start blogging with a fully-loaded WordPress site!